From the eyebrow experts comes threading. Favoured by Kim Kardashian, Angelina Jolie and a variety of other beauty icons, threading is the ultimate way to get enviable brows. 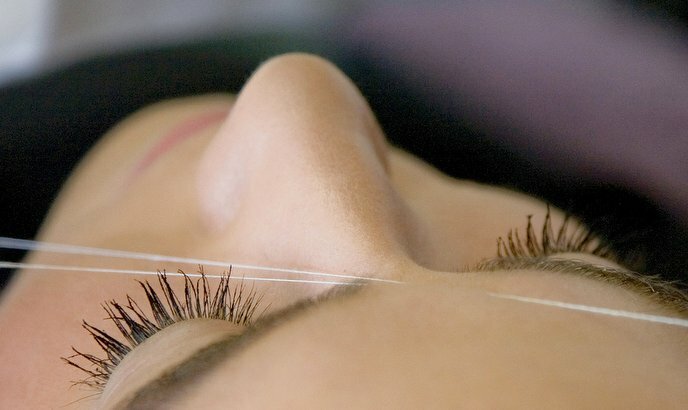 Originating as an ancient hair removal technique over 6000 years ago, threading is a popular treatment designed to frame your face for the better. Legend has it that threading first began in India, which would explain why Indian women have such on point eyebrows! But while threading is most commonly used for brows, it’s worth noting that it’s also a highly effective way of removing unwanted hair on the entire face and upper lip area. Here’s what you can expect. Like other hair removal treatments, threading usually takes place in a relaxing salon setting. You’ll be asked to sit in a designated chair and your therapist will discuss your aims with you before getting started. If you have any specific goals, such as growing out your eyebrow arches or wanting to thicken the ends, now’s the time to mention them. It’s fast, precise and allows for better definition of your brows, leaving them full, perfectly-shaped and symmetrical. Your therapist will then roll a thin cotton thread over the desired area, plucking those pesky unwanted hairs at the follicle. Threading is a surprisingly skilled technique, with the cotton thread being doubled, twisted and then rolled out. Unlike tweezing, several hairs are plucked at once providing more control over the shape. It’s fast, precise and allows for better definition of your brows, leaving them full, perfectly-shaped and symmetrical. The benefits go far beyond the aesthetic alone (which is amazing, take our word for it)! For starters, it’s the gentlest hair removal treatment for your skin, and the pain is minimal, often being described as the feeling of tweezing a few hairs at once. On that note, threading will also save you time because, unlike other hair removal treatments, you won’t need to pluck between now and your next session! Depending on the density of your hair, the results usually last around 5-6 weeks. Plus, your freshly threaded eyebrows will be easier than ever to fill in yourself which means more time in bed! Some salons even offer an Indian-style head massage following the treatment. Once the shaping is done, your therapist may ask if you’d like your eyebrows trimmed. As long as your hair isn’t super fair, we recommend saying yes. It’ll make them even neater. You’ll then be handed a mirror for closer inspection. Providing you’re pleased with the results, you’ll be offered some aloe vera to cool down the redness (which should disappear entirely within an hour) and then you’re free to show off your new and improved look. Perfect! Make wonky, sparse and unruly brows a thing of the past. Browse and book a threading appointment with Treatwell.